Starting it off with the eyes. Personally, my eye make up is the one thing I get adventurous with. I'm not a huge bold lip kinda girl so when I want to inject a sense of personality and colour all arrows point to my eye make up. MUA as a brand are right up there with some of my favourites in the drugstore and their £1 Khol eyeliners are one of my absolute favourites. They come in a huge selection of colours ranging from your traditional blackest black to nudes, greens and purples. My colour of choice always has to to be Electric Blue (Find out how I create the look here). The pencils are so soft and pigmented and the handy sharpener on the lid helps out a hell of a lot. Maybelline mascaras in general have always been my Go-To's when I was a dramatic lengthening look and their new "Push Up Masacara" release is no different. This mascara achieves every single one of their claims and is perfect for every wear and is easily builded to create a dramatic night time look. Also recommend checking out their Lash Sensational mascara too - perfecto. Let me just put this out there ... I don't own many high end eye shadow palettes. I'm not sure exactly why not but I think it's because the majority of the drugstore dupes I've found seem to be doing the job just great. One of my personal favourites is this beauty by Collection. The colour range is right up my alley and the shadows are perfectly pigmented. So I wrote my "Ultimate Drugstore Primer Battle" over a year ago where I gave a run through of SO many drugstore primers and let you know the hit and misses of my collection. Well this was before the L'Oreal Infallible primer made it's way into my make up draw. Ever since this has been my daily go to primer as it provides such a smooth base for my make up to sit on and also helps mattify my dreaded oily T-Zone. Let me just keep this short and sweet because I'm sure you've all heard the raving reviews for this foundation and I expect most of you have already got your hands on it. But for an everyday, dewy foundation this is absolutely amazing. I love the natural finish it gives me and their colour range is full of so much variety, so finding my perfect shade was a piece of cake. Again, a cult classic has made it's way to my top 10 and with great reason. I've tried a number of both drugstore and high end concealers over the last few years but I cannot stop repurchasing this again and again. The coverage, consistency and price all have me sold - I'm already on my 5th bottle of this (thanks to my mum becoming a fan too)! When it comes to finishing powders I'm always quite sceptical of drugstore brands. I think it's because from my experience they usually are either too light or too heavy and have me looking like a cakey ghost. But I found the perfect finishing powder by Soap and Glory. I picked this up after recommendations by Kaushal Beauty and I totally understand the hype. It's great at preventing under eye creasage and, if applied lightly, can lock in your foundation or cream contour perfectly. With millions of contour kits on the market, all promising that perfectly chiselled Kim K look it's difficult to know which one is worth the buck. Contour is something that can look amazing or turn out a hot mess so I understand why people invest on some of the higher end products. But I have found an amazing kit from Sleek, which was one of my first ever contouring products. Whilst the highlighting side doesn't get much use from me the darker side is the perfect shade and is so buildable without looking powdery or chalky. What's the use of all this make up if it's going to magically disappear from your face after a couple of hours? That's why I religiously make use of the Nyx setting spray to keep me looking fleeky all day. They do both, a dewy and matte finish, which I rotate depending on my needs. All in all this is a perfect everyday setting spray and helps me save my pricier Urban Decay Setter for special occasions. So while I was rummaging around my make up collection to find the best products for this post I had a handful of make up application tools and brushes to choose from but this brush stood out as an ultimate favourite. I actually use this brush on a daily basis to blend out my contour (with the Sleek Contour Kit) and it works perfectly. The slightly tapered end and dense bristles make blending so easy and for such a reasonable price point I don't have a bad word to say about it. 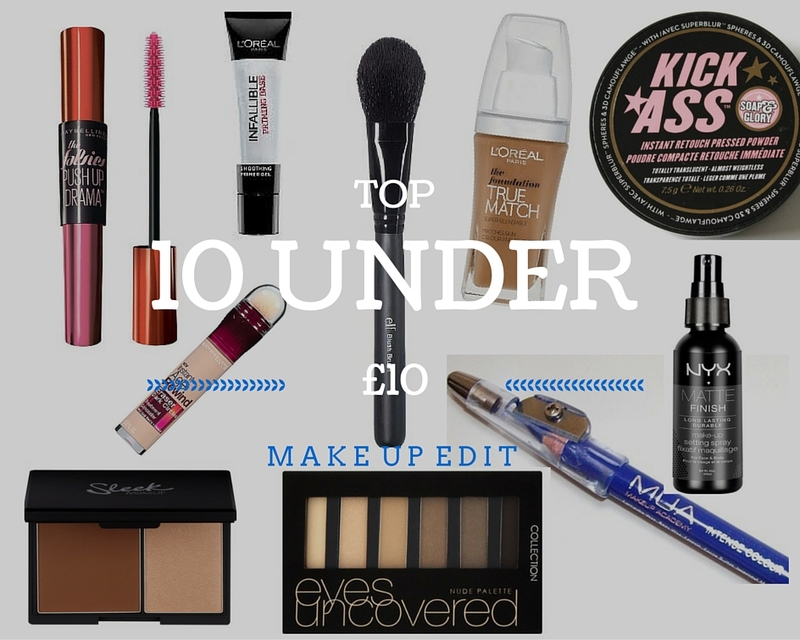 And there you have my TOP 10 UNDER £10 | MAKE UP EDIT. Hope this post helped you source out some amazing, affordable products! 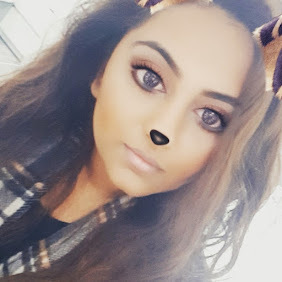 I'd love to hear your favourite under £10 make up bits. Let me know below!